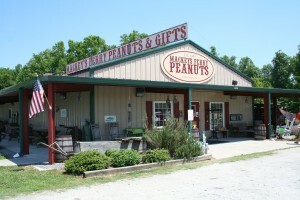 Since 1983, Mackeys Ferry Peanuts has used the best peanuts grown in Eastern North Carolina to create premium peanut products for peanut lovers everywhere. We entreat each one of you to visit our store in Jamesville and to try our delicious samples. For those of you with a penchant for sweets, we offer the most delicate hand-stretched Peanut Brittle, homemade Molasses Cookies (my Grandma’s recipe), a variety of chocolate treats (Butternut Crunch being a favorite), and Peanut Butter Cookies, made with our very own fresh ground special recipe Peanut Butters. Avid peanut snackers will enjoy our Blister-Fried peanuts, French Fried Redskin peanuts, spicy hot Flame-Thrower peanuts, unsalted all natural Plain roasted peanuts,or our classic Sugar-Coated peanuts. For a distinctive gift from rural North Carolina, consider our unique rustic gift boxes, featuring and assortment of our products and decorative printed lid with a NC theme. We offer custom designed lids for your corporate needs as well as a variety of card stock gift boxes to suit any price range. Your visits are always welcome and appreciated in our store. – Sharon and Chris Smith, Owners of Mackeys Ferry Peanuts and Gifts.